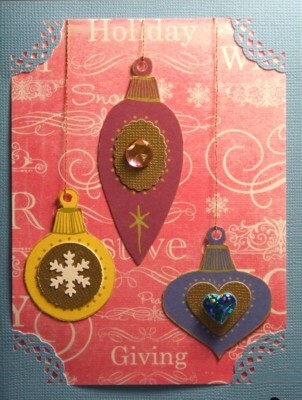 This Christmas card is a good way to use up scraps of card stock as well as spare embellishments since the ornaments can be decorated any way you like. They were made using a Christmas stencil I bought several years ago but the shapes are quite simple and could be drawn by hand. I used a gold gel pen to add details to each one.